Winners, Winners, and More Winners! The Bedouin Peacemaker's Quilt Show 2005 was adorned with lots of beautiful quilts from children, beginning quilters, and veteran quilters. 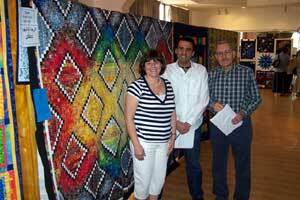 Helena Zakharia won the Stars Challenge Quilt for People's Choice Ribbon. Helena had a beautiful wall sized hanging of a man and woman standing on top of the world with a star burst flying through the sky. Sharyn Law-Davis won the Stars Judge's Choice Ribbon. Sharyn made a lovely evening star scene wall hanging looking into a framed window. Sharyn Law Davis is from Australia and her quilt depicts a view of the Southern Cross, visible only in the Southern hemisphere. Helena Zakharia won first place with her Heart on Fire quilt. 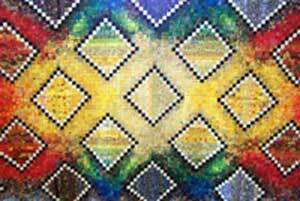 An amazing quilt made up of over 8,000 pieces of fabrics. This fabulous quilt was hand quilted by Helena! Margit Tiefenthaler won second place with Rheinland Grapes . Margit made trapuntoed grapes on the back ground surrounded with stippling. A gorgeous lavender and cream colored quilt that would compliment any wall. Pat Davis's Blooming Nine Patch is a stunning double sized quilt that she started in an afternoon workshop. Pat's beautiful floral and paisley print fabrics awed the viewers to take third place. 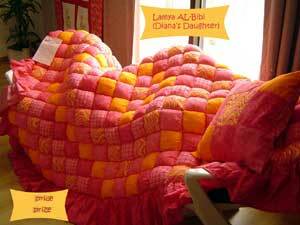 Lamya Al Bibi won the Beginner's 1st Place with Lamya's Gift , a beautiful, fluffy, and bright colorful quilt that Lamya made as a gift for a very special teacher in her life. The Spring Challenge India winner was Aaliya Ahmed. Aaliya's quilted elephant wall hanging took the winning ribbon. 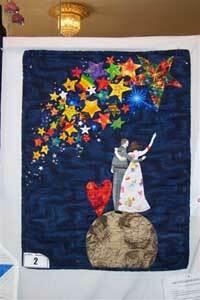 Congratulations to Bedouin Piecemakers member Kathy Brown for winning the Starry Night raffle quilt.